19 Mar Do you get heel/ foot pain with your first few steps of the day? Or does your heel start to ache after walking for a prolonged period? If so, you could have plantar fasciitis or heel spurs! 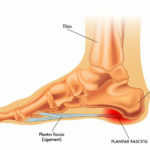 Basically, Plantar fasciitis (fancy name for a type of heel pain) is a disorder of the plantar fascia, the thick ligament like tissue on the bottom of the foot. The role of this tissue is to help maintain the arch in your foot. When there is excessive strain put onto this ligament (ie forces trying to collapse the arch of the foot) the attachment of the tissue to the heel becomes irritated and you end up with heel pain. In severe cases there this tissue can also be torn (think long term immobilisation in a boot or worse – surgery!) and if it becomes a chronic condition, heel spurs may grow in response to the load. So, what are the typical features of plantar fasciitis? Pain worst when you get out of bed in the morning or after you’ve been sitting for a while and start walking again. What might be causing my heel pain? Why does this need to be treated? It can get worse! Did you know that occasional pain from plantar fasciitis can progress to constant heel pain even when resting (if not treated correctly)! Don’t rub the sore bit!! Think of the sore bit as a bruise – if you are rubbing it (or worse, rolling it on a tennis ball) you are effectively making the “bruise” worse. There is definitely a time and a place for rubbing, but the sore bit isn’t it!! So, what should you do if you are getting heel pain……..? Make a Physiotherapy appointment and come in and see us – we see people suffering with heel pain every day and we help them get back to walking normally and painfree quickly and safely. Restore normal mechanics to the foot and whole lower limb to ensure that this problem doesn’t persist. Assess and improve running and landing techniques if appropriate. Reducing your pain will help prevent the problem from getting worse and becoming a chronic problem, and help you return to a happy and active life! Walk happy and painfree – Call us on 99050048 or go click here to make an appointment online today!